Carolin - I should have brought some of my Mars and Moon ones in - I keep them at home because they're too precious. Graihagh - Yes, she is talking about meteorites from the Moon and Mars that just happened to fall on Earth and she is Dr Carolin Crawford - lover of space rock, naturally, but also an astronomer at Cambridge University. We met to compare our rocks but first things first - what's the difference between a meteor, meteorite and meteoroid but a comet and an asteroid?! Carolin - Yes, it is complicated and astronomers do love our terminology. So, you've got lots of lumps of rock; the debris that you said floating around in the solar system. Now if it is made of ice - like a frozen iceberg 5-10 kilometres across or smaller, we tend to call it a comet even though it might have bits of dirt and dust within it. So comets are the icy bodies. Asteroids are the rocky debris. And we won't talk about things called Centaurs which are half ice half rock. They're out beyond Neptune - we won't worry about them so much. But, basically you've got your asteroids which are rocky and you've got your comets which are icy. Now a meteoroid is like a tiny asteroid. You're talking about a few microns across to a few metres across in size. So it's just debris, like the asteroids, left over or fragments from a collisions or protoplanets, that's been hanging around for billions of years in the solar system and floating around between the planets, around the Sun following their own orbits. Now as soon as that meteoroid starts to enter Earth's atmosphere it becomes a meteor. That's what you know as you're shooting star and that's when you see it burning up in the atmosphere. It sort of excites the air molecules and you get this trail of ionised particles which shine, and you also get the lump of rock, even if it's tiny, it will still give of an amazing amount of light because it's travelling quite fast. Most of them disintegrate in the atmosphere completely but, if they survive to hit the surface of the Earth, then they become a meteorite. So that's the distinction: Meteoroid when it's in space, meteor when it's in air, and meteorite when it's sitting on the ground. Carolin - Did you bring this meteorite? Caroline - OK let's have a look - see which one you got. Graihagh - How much do you know about meteorites? Carolin - I'd say it's a nickel/iron one. Graihagh - Oh - controversial! Carolin - Oh it is! It's Campo de Cielo. Graihagh - I'm going to ask you how much you can tell me about this because this is Connie's meteorite that she won and, other than giving it a quick look up on the internet, we know nothing. Carolin - This is one of the more common falls. Carolin - You've got two very famous falls - you've got the Campo del Cielo. And this is part of the Sikhote Alin fall. I mean I like this one - you can see how it's just sort of melted as it's fallen through the air. It's all kind of deformed and ruffled up - I like it particularly. Graihagh - It reminds me of... do you remember The Futurist (the painters) - The Futurists. You know how they had these very choppy, jagged types of paintings - that's what it reminds me of. Carolin - Or it just looks like a parrot! It is deformed. I mean you look at that and you see a mangled bit of metal and you think gosh, that metals gone through a lot to get to be that shape. So I think this is part of the Sikhote Alin fall, so this fell in the Sikhote Alin mountains in 1947. Graihagh - So you're one's much more recent? Carolin - Yes, this one they actually saw the fireball through the sky. They saw the meteorite coming in and later found the pieces. Whereas the Campo del Cielo, we think fell thousands of years ago but it was only more recently found. Graihagh - You've mentioned two types of different falls there. Is it quite rare for this sort of stuff to fall to Earth or is it quite common? You don't look like you believe me. Graihagh - Well, I was really pleased that we'd won there so now you're telling me (I say we), Connie has won this and it's not even that rare. Carolin - They are rare. I mean it sounds like a lot but, in terms of volume and mass of the Earth, it's miniscule. Also, what you've got there is one of the metal ones - they're the rarer ones. Graihagh - The reason why I ask if it's rare, and I'm glad you say it's rare, I've got this meteorite for the weekend now. If I was to go away and sell it, what sort of price does this thing fetch? Carolin - For the size you've got there I would guess about £60 or something. Graihagh - Oh, that's pretty reasonable! Carolin - I think it's pretty reasonable. Graihagh - Dinner out! Because now I'm going to go everywhere I walk I'm going to have my eyes on the ground looking for these things. Carolin - You get three basic types: The most common ones are the ones that are rocky. Then you get the iron ones, so that's iron and nickel alloy. And then you get stoney iron which are the mix of the two. This is a rocky one - well we call it stoney and you see it's got a sort of black crust on the outside. Now that would have been the outside of a meteorite as it fell through the air so this is where it had been burnt. We call this the fusion crust because it's where the rock has fused, effectively, under the extreme conditions as it falls through the air. It gives you a bit more of a character. Graihagh - Oh yeah. Tiny, like a pinhead. Carolin - Yes, but just a little inclusion of the metal alloys within it. This is an example of a stoney one that is very nice because you see it's got a mottled appearance. Graihagh - Dare I say, a bit like sometimes when I'm walking down the street and you see all the little bits of rock within, what's it called - pebbledash is what I'm thinking but in a miniature polished form. Is that a terrible thing to say? Carolin - No. You're getting the idea across beautifully there. It is just speckled and you've got these almost like spherical - we call them inclusions - little bubbles of dust and carbon materials that's held within the silicate base. Graihagh - So where do these things come from? I mean I know they're space rock but why do they end up falling here on Earth for people like us to scurry around and collect them? Carolin - They come from a number of different places, but you're quite right, they're lumps of space rock or, if you like, space metal that are floating around there orbiting round the Sun. Now some of them, especially those rocky/stoney ones, are left over from the original solar system formation. They are bits that just didn't get incorporated into being planets. Or they could be fragments of asteroids. You know, you can imagine protoplanets in the early solar system, asteroids now colliding and scattering fragments off. And then you have some that are really exciting and they're where a meteorite has impacted another planetary body. So it's something like the Moon or Mars or say Vesta, the largest asteroid in the asteroid belt. And when the meteorite impacts that body, it send an ejector out but because things like Moon, Mars, Vesta don't have so much gravity, not all of it falls back down to the planet. It then goes out into space and starts orbiting the Sun and, maybe millions of years later, it happens to fall on Earth. So some of these meteorites are bits of Mars, they're bits of the Moon, or bits of Vesta. Graihagh - Oh, are you about to show me a rock from Mars? Carolin - No, this one's a bit of Vesta. Carolin - Which is surprising common. If you look at Vesta, this is the object that's about 500 kilometers across in the asteroid belt, it looks a bit more more like a punctured football. It's got a huge sort of gouge out of the southern pole and that's where we think it underwent a huge collision sometime ago in its past. So there are lots of fragments of Vesta around and this is one here. Graihagh - How do you know that? Carolin - You know because of the mineral makeup. I was telling you you've got all these different origins for different kinds of meteorites and, looking at the chemical composition of these rocks, you can tell a lot about whether they're pristine parts of the solar nebula or they've come from bodies that have undergone what we call geological differentiation. So you've started to have that geological processing, the separation out of the metals and the sort of silicate crust. So, when you hold something like your Campo del Cielo that's completely metal, that would have come from the inside of one of these differentiated bodies. So like a small asteroid that was forming or a protoplanet that was forming before it got smashed so you've got a bit of the core part of the asteroid there. A lot of these stony meteorites are much more of the pristine debris left over from the early solar system. Graihagh - So why is it them that we're interested in things like 67P, and we've sent out Roseta and we've seen Philae land on the comet? Why though if all this stuff is falling down on Earth all of the time? Carolin - there's a lot of science you can only do when you're in contact with the astronomical body, like the comet Nucleus, and that was what was important about the Philae lander. And, of course, you've got to remember that comets are mostly ice, not just water ice, but also methane ice, and ammonia, carbon monoxide, carbon dioxide. If you want t understand the icy part of the comet, you've basically got to go out there. 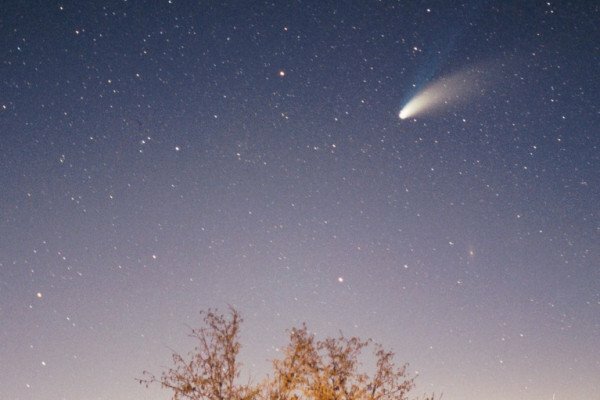 Previous What does a comet smell like? Next Connie won a meteorite!